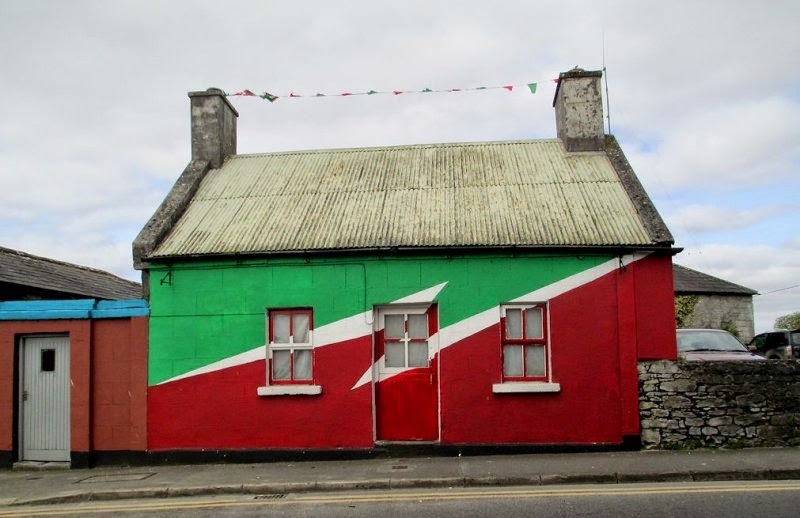 As I type this, it's about half an hour to "throw-in" and the start of the match--or more accurately, the rematch-- between Mayo and Kerry in the GAA All-Ireland semi-final. 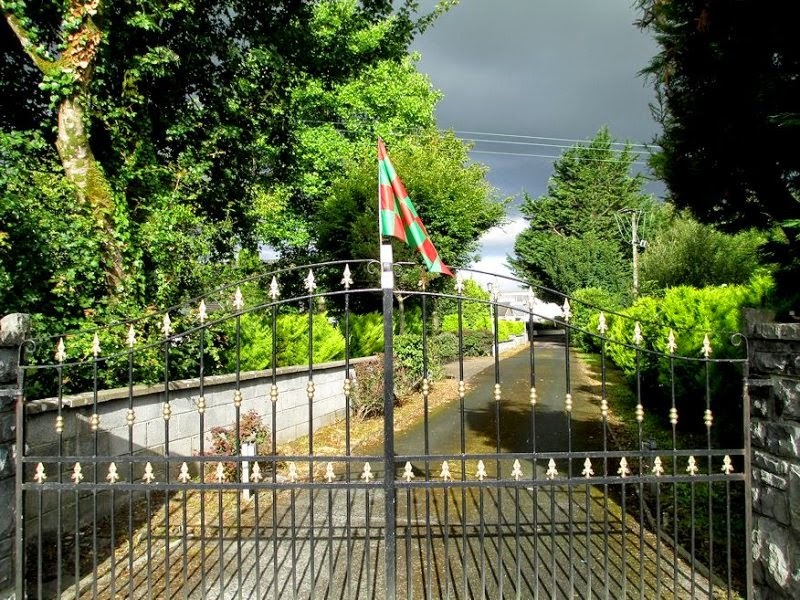 The winner will play the winner of Donegal-Dublin. We were puzzled about which sport this is. Rugby? Soccer? Hurling? None of them! Turns out it's Gaelic football, which is similar to Australian rules football. Sounds complicated to me, involving as it apparently does counting steps allowed while holding the ball in the hand, special sorts of kicks and bounces, and stuff like that. They play in shorts with no padding or helmets. This is quite a big deal here. Flags have always been flying, but the sheer number of them has increased dramatically in the last weeks. The game was actually played last weekend, but they played to a draw, so the replay is today. 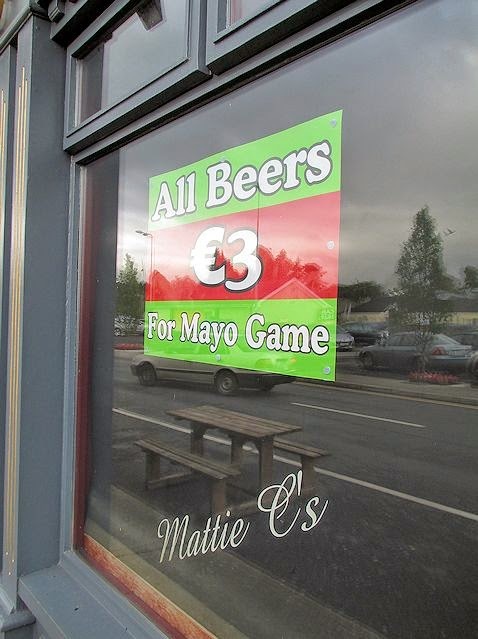 It had to be moved to Limerick instead of being played at Croke Park in Dublin, because US college football is being played there--much to the unhappiness of Mayo fans. There is some anger at the fact that this totally Irish event is being pushed aside for US college football at the major GAA stadium in the country. On the bright side, Limerick businesses are pretty pleased, since they are getting a lot of visitors that were unexpected until last weekend. I've read that the B&Bs are full to capacity. 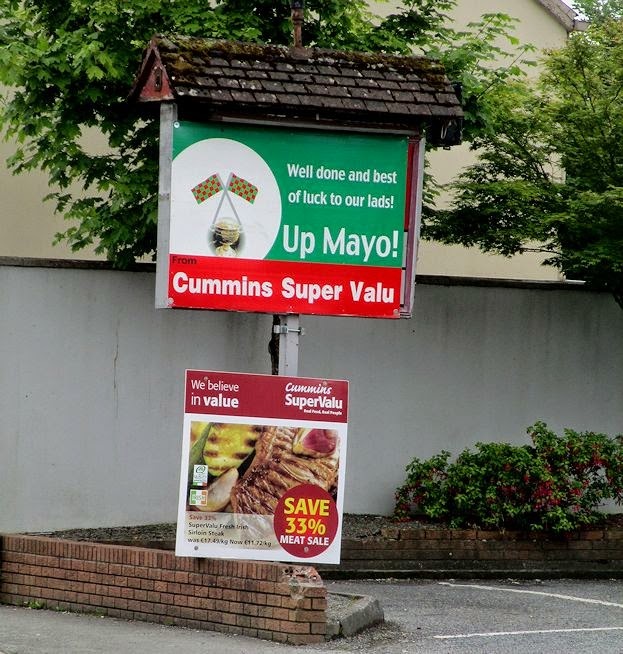 Here in Ballinrobe, the signs have been going up on businesses and flags have been flying on homes, businesses, town monuments, and cars. Red and green is fluttering all over town--feels like Christmas! There are a few different flag designs and they come in all shapes and sizes. 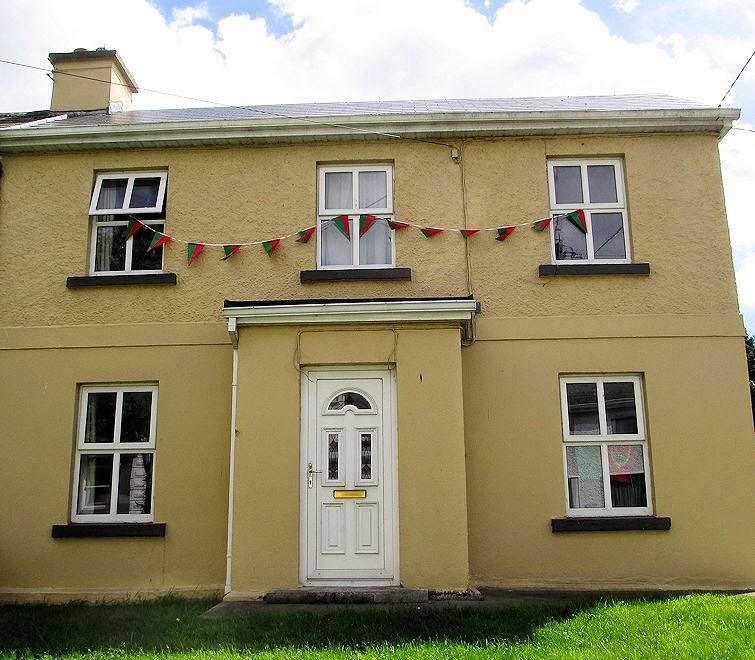 People have strung bunting on their homes (we have some on the deck railing from past years--it's all faded now), tied large flags to the luggage racks on the roof of their car, have flags sticking out of the car windows, attached them to windows, and planted flagpoles in their yards! A few cars have Mayo wind socks flying from their car windows. 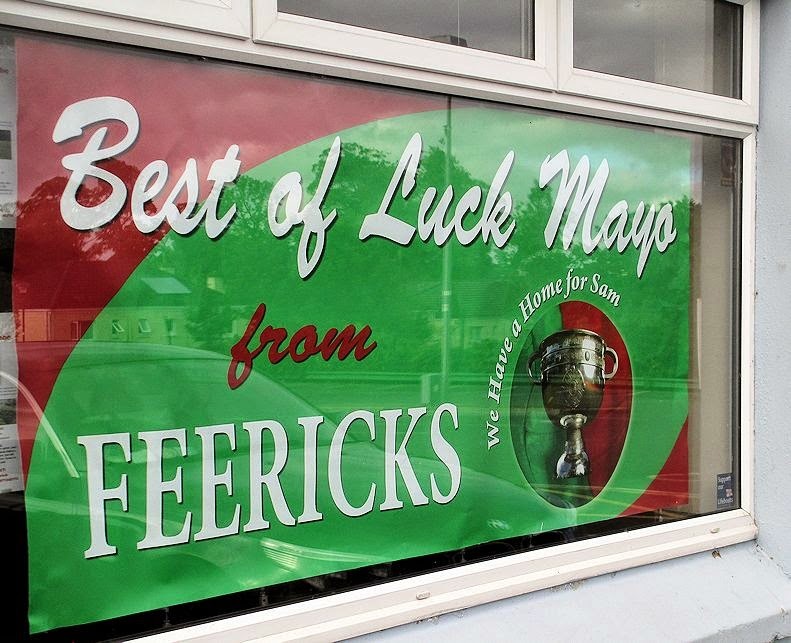 If they lose, there will be some pretty bummed out Mayo-ites. Or Mayoians. Or whatever. We were out walking today and commenting on how few people there were out and about. We did stop to chat with a woman who was walking with her dog in the opposite direction--she greeted us with, "I've seen you before," and proceeded to ask us questions and tell us about her dog. She was quite friendly. There was a garda car parked across the street waiting to catch speeding folks. She said they can read the speed from down the road and sure enough, a car came alongside us and the garda was out of his car, walking across the street, and gesturing with a couple of fingers that the driver should stop. The driver stopped and got the ticket and went on their way. After we'd walked on, the garda got someone coming the other way. Traffic was pretty light for a Saturday--crossing the street was not as much of an adventure as it usually is. On the way home we stopped at the library, which had no one in it besides us and the librarian. When I commented on how quiet it was, Mary replied, "It's because of the match." That must've been about noon. The match starts at 5. It's kind of like the Super Bowl in the US, I guess, where the partying and preparations begin early. I told Mary I hoped she'd be home in time for the match and she said she'd be home in plenty of time, since she would be getting off at 4. As we were leaving, an elder woman wearing red and green was entering. Almost game time!